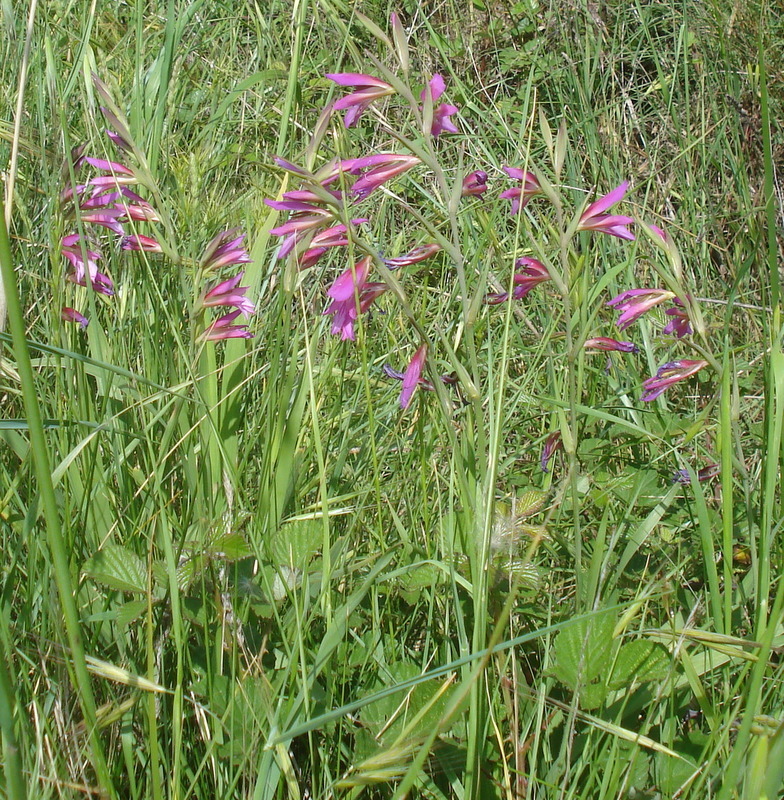 A smallish plant, usually up to 50cm tall – not to be confused with the showy garden flowers, emblem of Dame Edna Everage, which are species from South Africa. Also known as Cornflag. The name is from the Latin gladius (sword), and means a small sword, from the shape of the leaf. The same derivation lies behind the French glaïeul and Occitan glaujòl, but I was interested that one Occitan name is la cotèla or cotelassa (pronounced cootaylasso) – a big knife. Adding -as (-assa for feminine words) to the end of a word is a common augmentative in Oc: enfantas means a big child, and more vulgarly you can call someone a plonker by using colha (testicle), or colhassa to call them a big plonker. It’s not a French form – so I was excited to think that it may be a rare example of an Occitan word becoming an English one: cutlass. The OED gives an Italian word – coltellaccio – as the source, but it must have passed through Oc. Anyway, the flowers are all the more lovely for not being an everyday sight, and I’ve usually seen them in ones and twos, in contrast to the groups and drifts, or colonies, of other flowers. Maybe they don’t propagate well by seed, and the corm at the base doesn’t often divide. I’m sad that they’re not in the catalogue of the usually comprehensive supplier of Mediterranean plants for the garden – Pépinière Filippi near Mèze (see www.jardin-sec.com on my new Resources and Links page). Now I confess that I identified these with our old copy of Flowers of the Mediterranean by Polunin and Huxley, and I see from my new and excellent Wild Flowers of the Mediterranean by Blamey and Grey-Wilson (also see Resources page for details) that they may be G. italicus – but I wanted the communis for my link to a song appropriate to a red (communist) flower – the Internationale. Thanks to my friend Pete for the link to this version, by the American singer Tony Babino, described on his own website as ‘one of today’s premier vocalists’. He’s best known for contributing this song to the credits of Michael Moore’s Capitalism: a love story (2009). While you’re about it, why not have a look at Pete’s own blog here: he’s a writer and if you’re interested in popular music, psychoanalysis and street photography this is the blog you’ve been waiting for. The French words to the Internationale were written in 1871 by a member of the Paris Commune, Eugène Pottier, and the tune by Pierre De Geyter (1848-1932), a woodcarver. It became the official anthem of the Second International, and of the Soviet Union until 1944. I still remember all the words to the first verse by heart from my youthful career as a left-wing agitator. Stand and raise your clenched fist after you hit the youtube play button to recreate all the atmosphere of a Seventies socialist youth rally. Coming up soon: roots and blues.